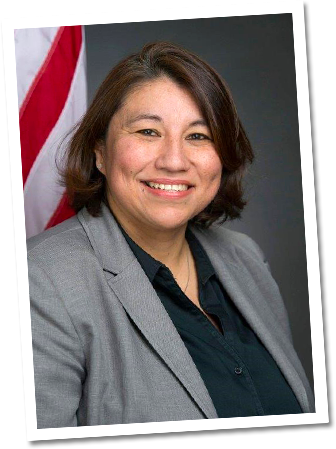 Elected in November 2014, Valerie Cuevas is the first Latina publicly elected to the West Contra Costa Unified School District Board of Education. In 2017, she was unanimously selected as President of the Board marking the first time a Latina/o has held the position. West Contra Costa Unified has 54 schools serving approximately 30,000 children seventy-five percent of whom are English learners, low-income or foster youth students. PROUD TO BE SUPPORTED BY WCCUSD STUDENTS, FAMILIES, SITE LEADERS, CLASSIFIED STAFF, AND CLASSROOM TEACHERS!!! We face a broad range of issues that we all need to work on together, from providing our students the highest quality instruction to retaining our hardworking teachers and site staff to developing positive school cultures for all students and families in the district. While I am honored to be WCCUSD’s first Latina or LGBTQ Board President, I am most proud of being an inclusive, solutions-driven leader for all." Valerie asks for your vote to ensure we keep investing in what matters most– OUR PEOPLE, from our students to our district employees to our local communities. Over the past 4 years, Valerie has championed increased ACADEMIC SUPPORTS for students, delivered MORE FUNDS to our local schools, created COMPETITIVE SALARIES for hardworking teachers and staff, passed a comprehensive POSITIVE SCHOOL CLIMATE policy, and improved ACCOUNTABILITY of the school bond/construction program. She is a genuine good listener. She supports her opinions with facts and logic. She is a strong leader. She understands how to use the Brown Act to promote communication. She is empathetic and compassionate. She is the model of civility. A third-generation Californian, Valerie Cuevas is the oldest of six kids raised in a hardworking union family. She grew up in a blue-collar neighborhood just like the Richmond community she calls home. From early learning in Head Start — the federally funded program for low-income preschoolers — to testing into the state’s Gifted and Talented Education (GATE) program, Valerie is a proud product of California’s public education system. A staunch advocate for kids, she is frequently featured in the media for her respected expertise and education equity advocacy. Currently a non-profit executive tasked with supporting integrated literacy and mathematics instruction, Valerie previously held student affairs positions at various 2- and 4-year colleges and universities across the state where she was a member of the California State University Employees Union (CSUEU). She holds dual bachelor’s degrees from the University of Southern California and a master’s degree in Educational Psychology, Administration and Counseling from California State University, Long Beach.